TOP FLOOR PARTIAL OCEANVIEW JUST STEPS TO THE BEACH! Located at the South Beach Condo's, this charming 2 bedroom, 2 full bath , open floor plan condo boasts fabulous partial view's of the Beach and wooden floor. There is a fully equipped kitchen with new appliances for all of your cooking needs. The den/living area features a sofa bed, cable TV, DVD player. The master bedroom features a queen bed, cable TV. The guest features 2 twin beds. Just step outside your door to the beach or sit on your private covered balcony and watch the beautiful sunrises. 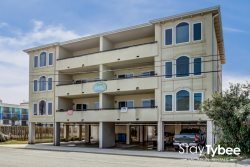 This spacious and comfortable unit is just what you need for a great Tybee Vacation! Covered parking for 2 vehicles (6'5' or less in height) Walking distance to the pier, shops and restaurants! Everyone was very nice. Exactly what was advertised. Very nice and knowledgable staff. Exactly what was advertised. Very nice and knowledgable staff. It was a perfect home for our family, clean, and a perfect location. The staff addressed concerns we had immediately, checkout and check in was very easy and a great price. It was a perfect home for our family, clean, and a perfect location. Unit was very clean. Rocky was very courteous and pleasant on the phone.